The historic and beautiful Dadaocheng area (大稻埕) of Taipei has a colourful history dating back to the 1850s becoming one of the earliest centres for trade in Taipei helping to fuel the development of the city and make the people living there rich. Today the area is a popular tourist destination and is well-known for putting its well-preserved history on display. Like a lot of other historically successful towns of the past, the merchant shopping area around Dadaocheng, specifically Dihua street has been converted into what Taiwanese people refer to as an "old street" (老街). These streets are quite common around the country and if you visit one (Daxi, Hukou, Sanxia) you will be treated to a historical journey through a town with preserved architecture and merchants selling local good and traditional products to the masses of tourists. Dihua Street (迪化街) in particular is busiest during the lead up to Lunar New Year when it becomes one of the most important places in the capital for purchasing traditional snacks and necessary items for the all important holiday celebration. 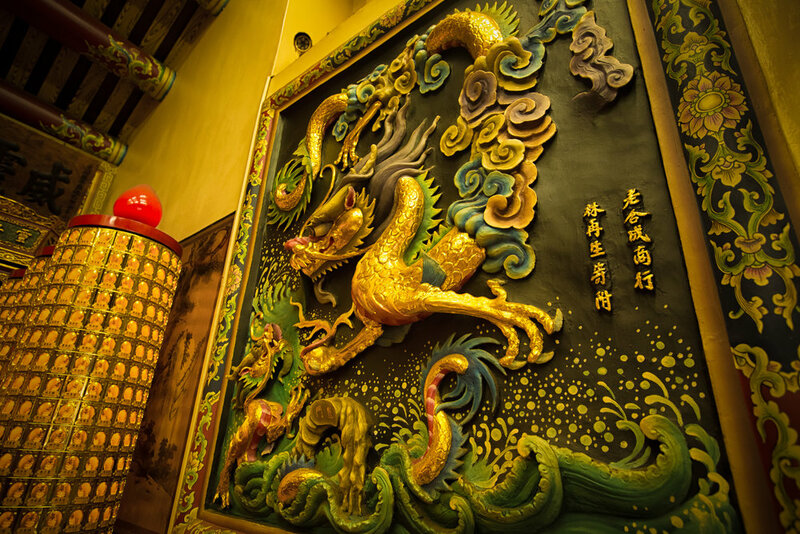 The area however is not only home to Dihua Street but also the Taipei Confucius Temple (台北孔廟), Bao-An Temple (保安宮), Ningxia Night Market (寧夏夜市), Daodaocheng Wharf and many other buildings that have been preserved for their historical importance. For more English resources check out the wonderful 'Love, Dadaocheng' website run by a fellow expat blogger who beautifully introduces the area in English. 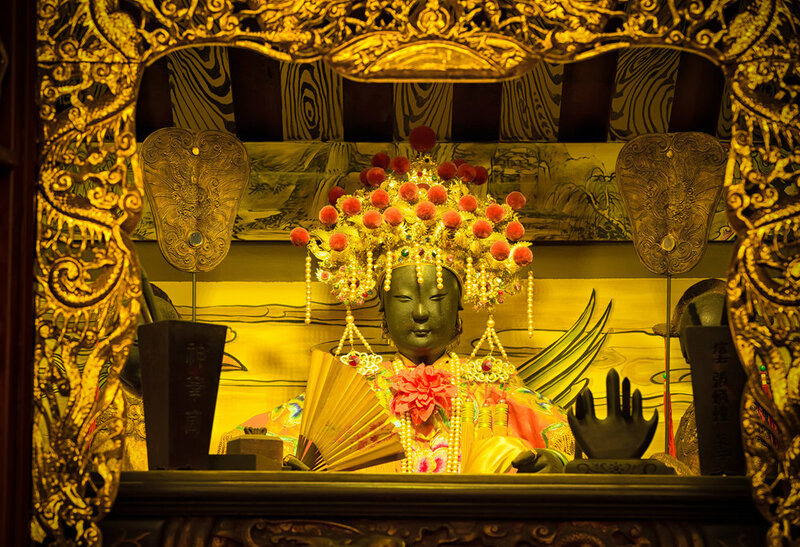 Today I want to introduce one of Dadaocheng's most famous residents - The Xiahai City God Temple (霞海城隍廟) which happens to sit in the middle of Dihua Street and is one of the busiest places of worship in the city. The temple is one of the oldest in the city and (as I was surprised to find out) has a very interesting history that is related to the immigrants who came to Taiwan and helped to develop it into the amazing country it is today! The Xiahai City God Temple is a small one, especially if you compare it to the so-called 'big three temples' of Taipei (台北三大廟門) or to its cousin, the Hsinchu City God temple. Size however is not an important factor to the thousands of people who visit this temple each and every day - both inside and outside are constantly jam-packed full of locals and tourists alike who visit to learn more about the city and its history as well as pray for peace, love and happiness. Despite having a 160 year old history in its current location, it is not the oldest temple in the city yet has been lucky to differentiate itself from the other 'older' temples as the structure you see today is the same one you would have seen in 1859 when it was first built. Unlike some of the other temples in the city which have had to be completely rebuilt on a few occasions, this one is still intact although it has undergone a few renovations over the years. Temples like Longshan (1738) and Bao-An (1804) are 'technically' older but have unfortunately had to be rebuilt several times due to natural disaster and war. Check out my blogs about them to find out more. The history of the temple (and the Dadaocheng area) is one that is intertwined with a group of immigrants who came to Taiwan in the 18th and 19th centuries originating in Fujian Province's (福建省) Tong-An County (同安縣), which is today a northern district of Xiamen city (廈門市). Having first arrived in Taipei and settled in the Bangka (艋舺) area of the city, the immigrants had a difficult life in the early days which were confounded by sour relations with fellow immigrants from Fujian. In 1853 hostilities broke out (頂下郊拚) between the four major groups of immigrants who occupied the port area. Being on the losing side of the conflict, the immigrants hailing from Tong-An county packed up and moved out of Bangka resettling in nearby Dadaocheng. The relocation however did not go very smoothly and over thirty-eight men died while transporting the City God statue from Bangka to its new home in Dadaocheng. The Dadaocheng area (Pronounced: Tōa-tiū-tiâ in Taiwanese Hokkien) was populated a few years prior with another group of immigrants from Tong-An who moved from Taiwan's northern port of Keelung to do business in the city. The move proved to be extremely beneficial for the merchants who fled from Bangka as they used their resources and knowledge to make Dadaocheng, with its wharf into a commercially successful port of trade that quickly overtook Bangka as the most successful port of trade in northern Taipei. Praying to the City God's Wife. Having learned from their experience in Bangka, the residents of Dadaocheng worked together to remove the possibility of conflict making the area a safe-haven for anyone of Han descent (漢人居住區) where it didn't matter what county or province you came from as long as you worked hard and contributed to society. Interestingly, as I mentioned in my blog post about Bao-An Temple (保安宮), the name of the temple (which predates the City God Temple) is actually a play-on-words in Chinese with the character "Bao" (保) which means to "protect" and also the first character of the Baosheng Emperor's (保生大帝) name while the latter character "An" (安) means "safety" and also refers to the people from Tong-An. To make a simple analogy, Bao-An Temple was constructed to act as a place for people to meet with a supernatural doctor to pray for assistance with health-related matters while the City God temple would be the place people would go to pray and make requests to a supernatural governor of sorts. 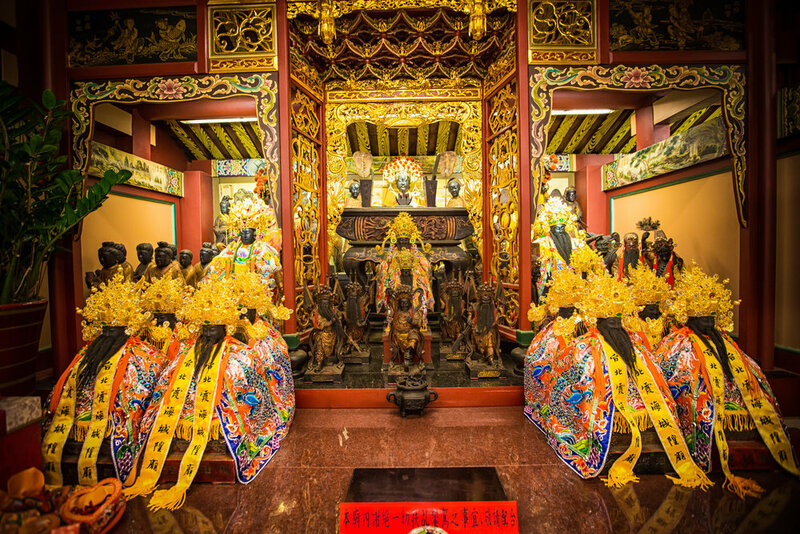 The two temples would work hand-in-hand to help protect the people living in the area as well as give them a place to meet, congregate and keep traditions alive making their new home in Taipei feel a little bit like their own. In 1856, an affluent general named Su Fei-Ran (蘇斐然) purchased and donated a suitable piece of land on Dihua Street for the construction of a temple while Lin You-Zao (林右藻) the leader of the Tong-An immigrants association worked to collect donations from the people in the area in order to build the temple. Construction commenced in 1856 and was completed in March of 1859. The temple was a small 46 square meter structure designed according to Feng Shui. Despite the important role the temple has served throughout its history, it has never expanded and has kept to its origin as a small temple that is likened to a "cave of a hen" which is said to help protect the people of Dadaocheng in the same way that a mother hen would protect its chicks. 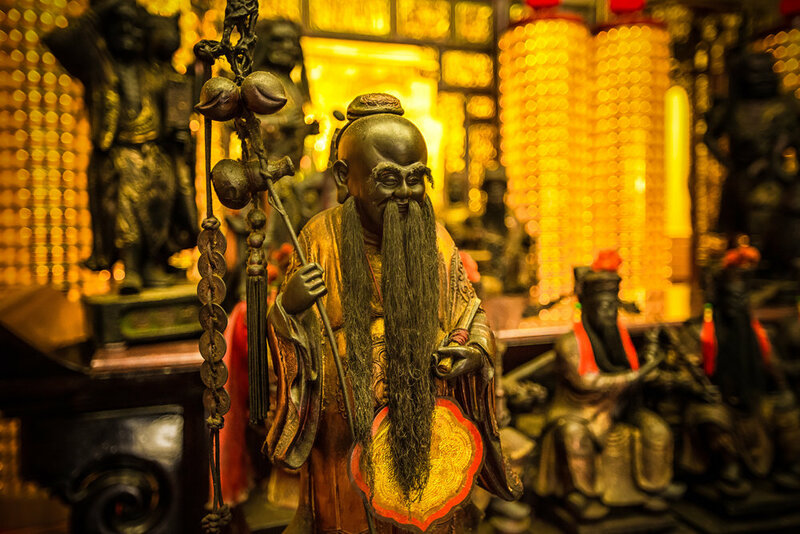 The City God (城隍神), or "Cheng Huang Ye" (城隍爺) is an interesting figure in Taoism and is an important god in the hierarchy of deities. 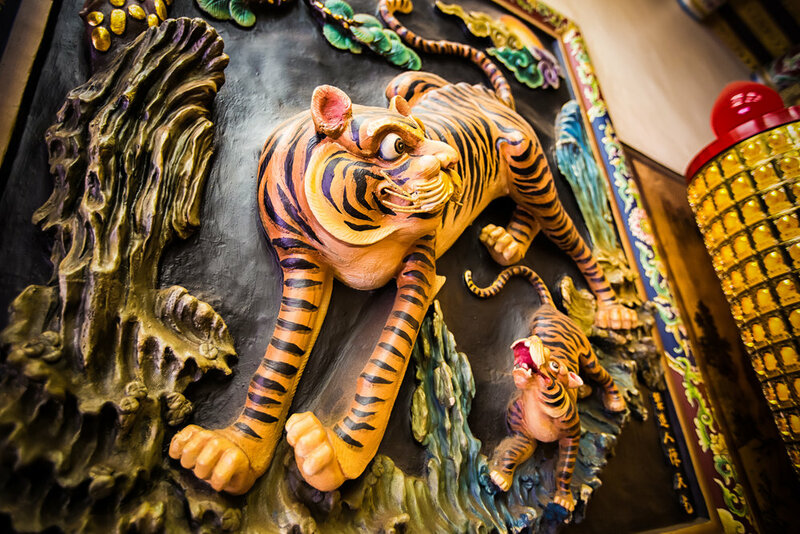 There are temples dedicated to the City God all over Asia with at least 95 in Taiwan alone. Worship of the City God is said to have started over two thousand years ago but is a religious tradition that has had to evolve over time with changes in political ideology as well as urban planning. The City God is a protector deity of sorts and is considered to be an important liaison between the living and the supernatural. The god was thought to have the ability to assist the earthly bureaucracy in making the right decisions as well as helping the government maintain order. The function of the City God, who is also known as the God of "walls and moats" (城 means 'city' while 隍 is a 'moat') was to act as a supernatural 'magistrate' of sorts that would make decisions about the city's governance (along side human colleagues), the final judgement of citizens who lived within the borders of the city as well as helping to keep it safe. 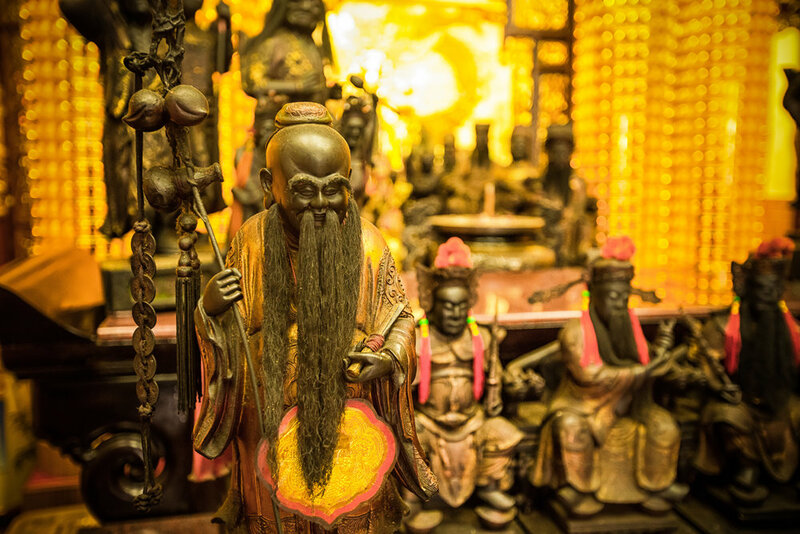 It is believed that the City God works together with appointed officials of the court (or elected government in Taiwan's case) to improve not only the safety of an area but also its prosperity. The City God's duties evolved over time into an all-purpose type of deity who not only held authority upon all matters in life and death within his specific territory but could offer assistance to someone with bad health, was robbed, was having business issues, etc. Interestingly, in the early days of City God worship, if people prayed for rain and the god failed to 'bring the rain', it was within their ability to hold the god 'accountable' and punish him. Punishments for such heinous inaction could include leaving the statue in the hot sun, or having the local governor or magistrate whip him. Holding a god accountable for not holding up his end of the bargain actually seems like a pretty good idea to me! Modern worship of the City God is much different and the notion of taking the statue out of its shrine to torture it seems like an impossibility. 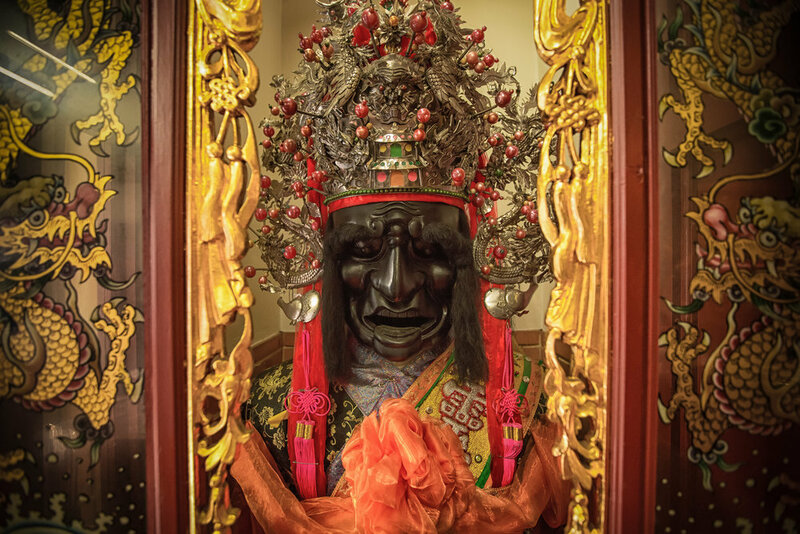 Today, the City God continues to be that all-purpose deity but is widely revered in Taiwan with 95 temples dedicated in his honour. The Xiahai City God temple in particular though is a special one due to the fact that the economic successes of the immigrants who lived in the Dadaocheng area seemed to be a direct reflection of the City God's favour. As a protective deity from their home, the City God in the temple became a symbol of the immigrants ethnic identity and was thought to be the mould that kept the people together. Every year, on May 13th (Lunar Calendar), Dadaocheng celebrates the "Xia-Hai City God Cultural Festival" (台北霞海城隍文化節) in honour of the birthday of the City God. The festival is one of the most well-known temple events on the yearly calendar in Taipei that features a parade, an inspection, a birthday feast, art performances, Taiwanese opera performances, traditional hand puppet performances, etc. The festival goes on for five days (May 14th - 18th) and while it is extremely loud, it is one of the happiest times of the year in Dadaocheng, so if you're in the area, make sure to try to take part. The City God's Wife is an important fixture in City God temples and a temple dedicated to the City God wouldn't be complete without a shrine to his wife. While the City God is busy being the all-important politician, his wife deals with matters of the heart and is known as a Chinese Cupid of sorts. She is a useful goddess to pray to when you are looking for love, marriage or having children - And even if your husband has bad habits like gambling, drinking or sleeping around - She'll help take care of that! This specific shrine to the City God's wife was created in 1894 making the statue over 120 years old. The shrine is used primarily by women, but it is also common to see men praying to the City God's wife to ask for help in making his wife happy or helping her become pregnant. 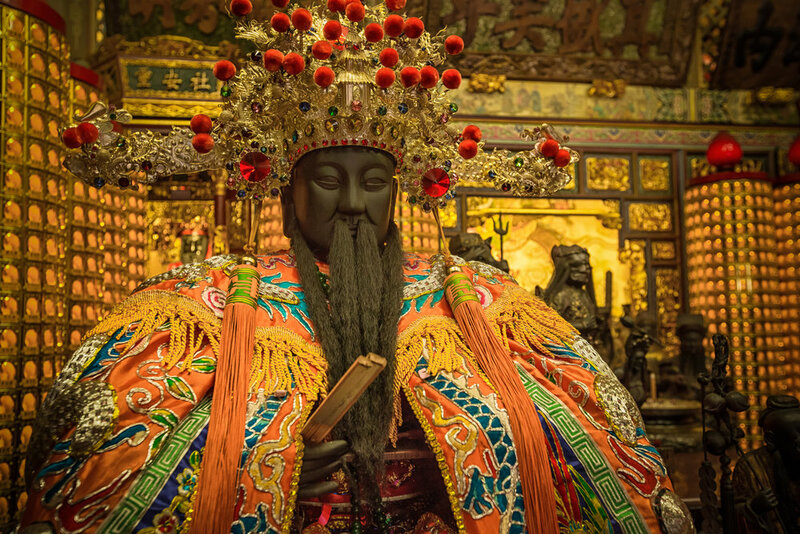 While it may seem like a sexist tradition to some, the City God's wife is just as important as the City God himself and despite their shrines being in different rooms, they are set up to represent the roles that leaders of the past would have had. The shrine to the City God's wife is set up to be very official and she seems to be working a lot harder than the City God himself. 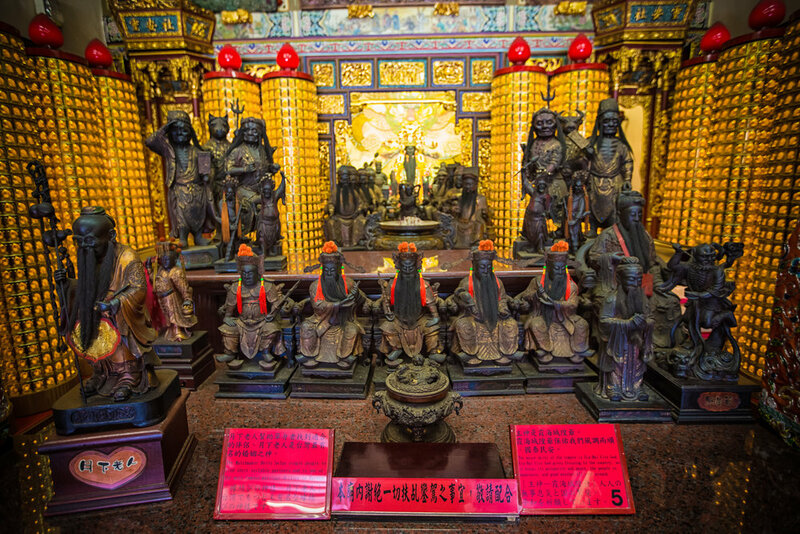 Accompanying the City God's Wife in this shrine is the Goddess Mazu (媽祖) who is one of the most important and widely worshipped of all the deities in Taiwan as well as the Childbirth Goddess (註生娘娘) who does pretty much what her name suggests. Women will pray to both the City God's Wife and the Childbirth Goddess for help getting pregnant, a successful and healthy pregnancy and a happy marriage. Another interesting thing about this temple is how it has evolved over time - While it is primarily dedicated to the City God it has since become an important place for people looking for luck in love. 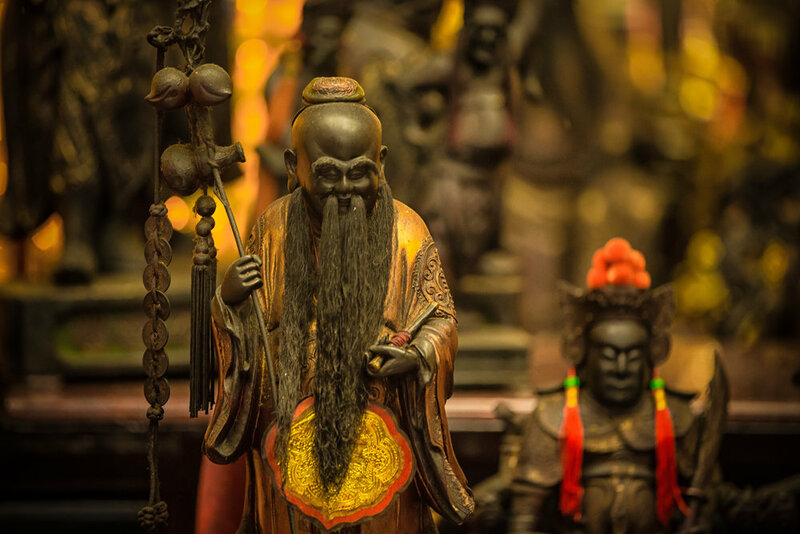 The temple's statue of the Old Man Under the Moon (月下老人) who is commonly known as "Yue-Lao" (月老) has become the most famous in the country and is widely revered for its matchmaking skills. Young people from all over Taiwan will visit the temple to pray to the god and also make offerings hoping that the god will grant them favour and they'll find that 'special' person. The temple keeps an elaborate list of all the people who have attributed the gods help to their finding love and if you do seek the help of the god it's a good idea to come back after the wedding and bring some of your wedding cookies as a sign of your appreciation. In Taiwan when something achieves the status of being "famous", word spreads quickly and means that lines are soon to follow. 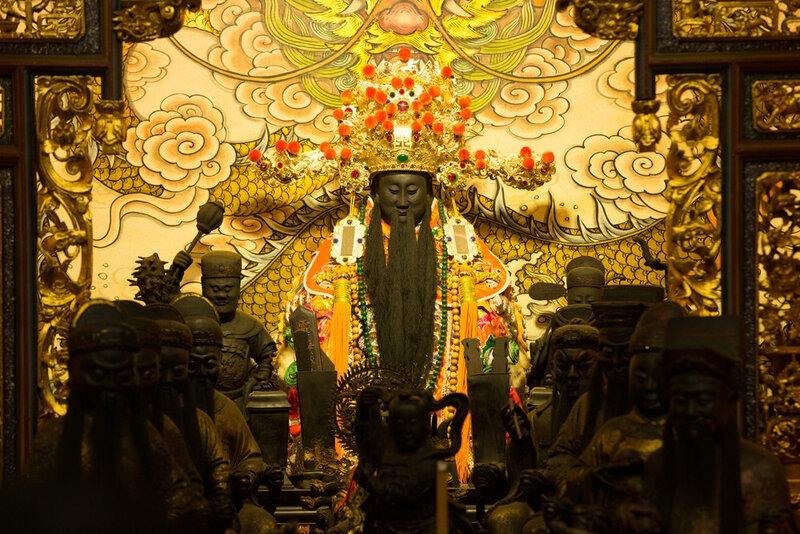 Despite the fact that fame is often a fleeting thing, the fame achieved by the Yue Lao statue and it's (so-called) miracles has somewhat trumped the importance of the City God in modern Taiwan making the temple renowned for its matchmaking skills than for the City God and its history. Interestingly, the fame enjoyed by this statue is not contained to Taiwan alone as it is well-known in Japan as well. If you visit the temple you will undoubtedly run into crowds of Japanese tourists who visit to seek help from the Old Man Under the Moon in matters of the heart. The temple has a special shrine set up to the "Brave Guards" that is very similar to the Yimin Shrine (義民爺) at the Yimin Temple in Hsinchu. The shrine is a very simple one that consists of a spirit plaque (神位) dedicated to the thirty-eight people who sacrificed their lives transporting the City God statue from Monga to Dadaocheng in 1853. In front of the spirit plaque are two interesting statues, one of General Shi Lang (施琅) and another of an interesting figure known as Taiwan's Robin Hood (廖添丁). General Shi Lang was the commander-in-chief of the Qing army which forced the surrender of the Kingdom of Tungning (東寧王國) which had its base of operations in Tainan. The so-called kingdom was a group of Ming (明朝) loyalists under the leadership of the Zheng clan (鄭). In 1683, General Shi Lang's navy landed in Taiwan and accepted the surrender of the Zheng's ending their rule over Tainan and their rebellion against the Qing. The importance of Shi Lang to this temple however is that his base of operations in China was in "Xia-Cheng" (霞城) which he helped build up into a prosperous city. 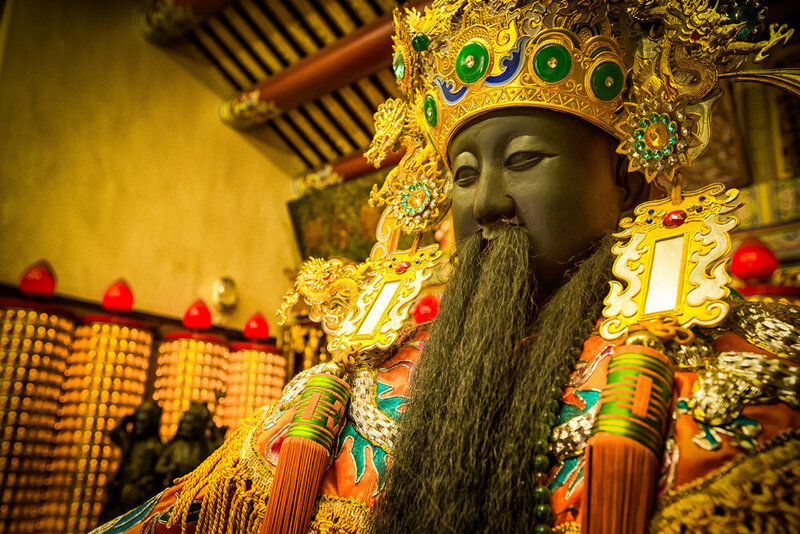 The statue of the City God in this temple was originally from Xia-Cheng, so the statue of General Shi Lang sits in the temple today to commemorate his founding of the city. Taiwan's "Robin Hood" is a whole different story and is one that is actually comical and somewhat hard to believe. Basically the story goes that a Taichung-born outlaw named Liao Tian Ding held a very low opinion of the Japanese during the colonial period and used his skills as a master thief to steal from the rich and help the poor. 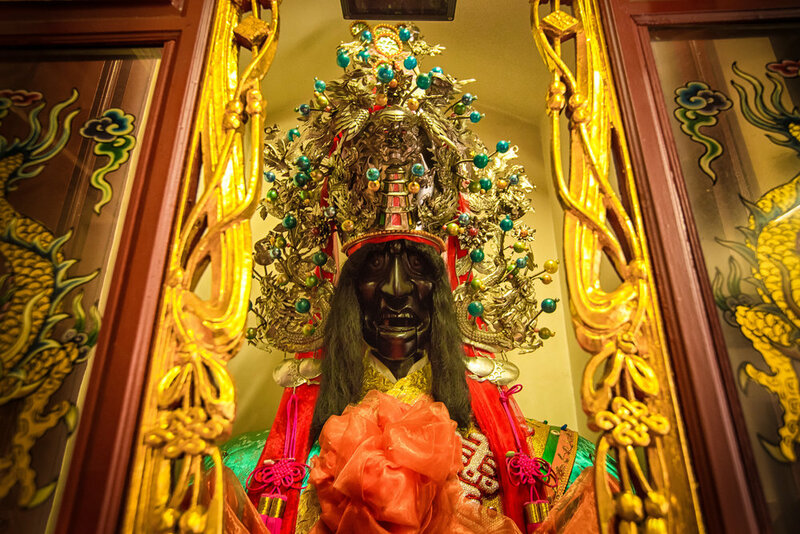 He moved to Dadaocheng which was an affluent neighbourhood of Taipei and after robbing from the rich, he hid his loot under the City God shrine which he would later distribute to the poor. Unfortunately Liao would die at the age of 27 while hiding from authorities in a cave. He has since become a folk hero and a statue of his likeness was placed in the temple to remind people of the relationship he shared with it. There has since been movies, tv shows, comics and games made using the character of Taiwan's Robin Hood, so while the stories of his legend might be as hard to believe as the English Robin Hood, its still a nice folk tale. 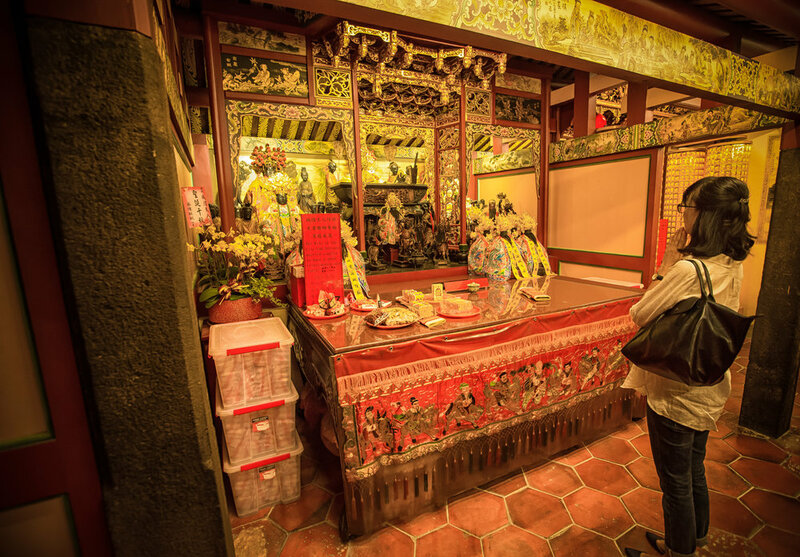 While the City God and most of the other shrines in the temple are dedicated to Chinese folk-religion deities, there is also a shrine set up for Buddhists. It may seem strange to westerners that different religions have the ability to intermix within the same building without explosions or violence, but that is the beautiful thing about the way Taiwanese people practice their religions. 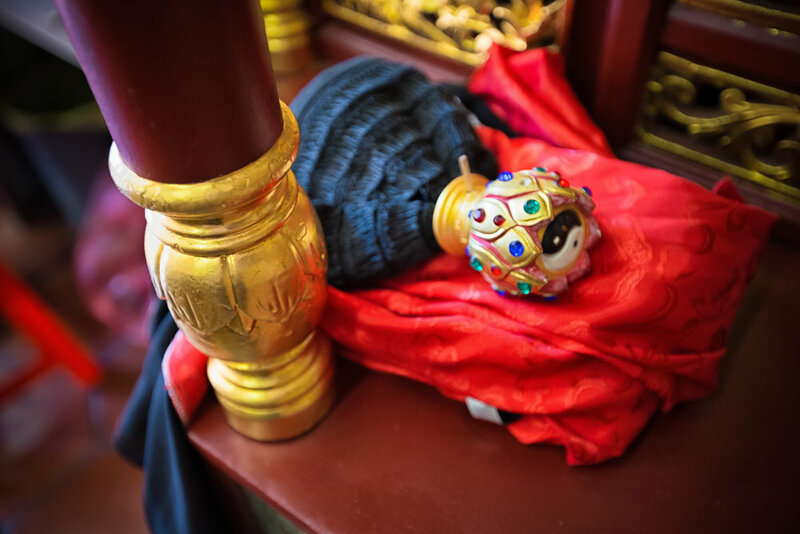 The combination of Taoism, Folk Religion and Buddhism in a single place of worship has become commonplace here and no one would ever find it strange. The Buddhist shrine in this temple is full of statues of the various Buddha's who are worshipped in Taiwan. 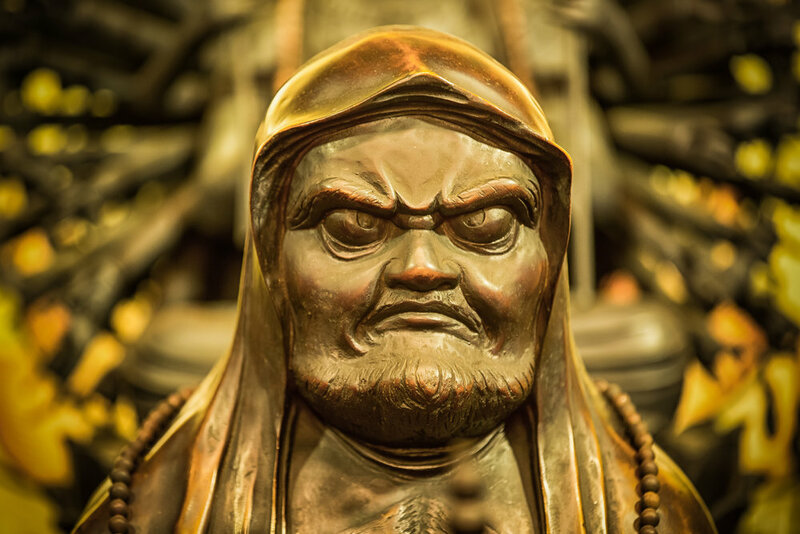 You will see Guanyin (觀音), Bodhidharma (達摩祖師), Ksitigarbha (地藏王菩薩), the Medicine Buddha (彌勒佛), Mulian (目犍連), the Earth God (土地公 or 福德正神) and Guan Gong (關帝爺). While the Buddha shrine in the temple is a small one (and mixed together with a couple of Taoist gods) it is a nice one as far as Buddhist shrines go in temples of this kind. 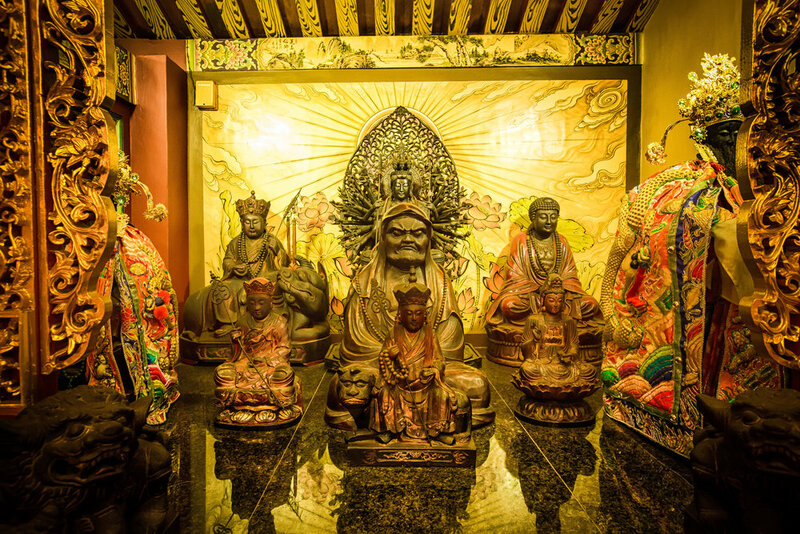 There is a wide variety of statues, some of Buddha's that you don't commonly see in Taiwan and they more or less are all made with the same material and very aged. The temple continues to this day to be an important place of worship for the descendants of the Tong-An immigrants but has opened its doors to all the people of the world who want to visit and show respect to the City God and the amazing history of immigration in this country. As a popular tourist attraction, the temple offers excellent multi-lingual services to guests from all over the world. 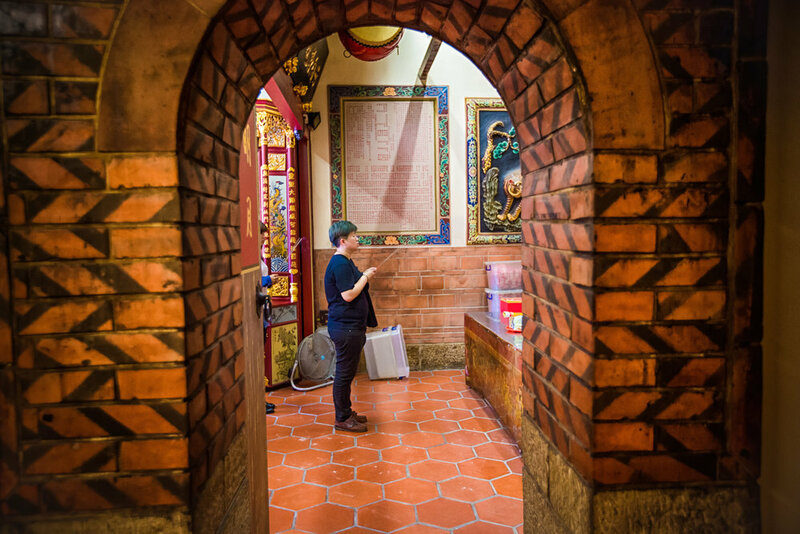 There are knowledgable volunteers who are available to offer guided tours and instructions as to how to take part in worshipping at the temple - not a common practice among some of Taiwan's larger more touristy temples. If you are visiting Taipei, a stop at this temple and a day of exploring the historic district is highly recommended - You can learn a lot about the history of the city and experience it while walking through the beautiful streets and alleyways!